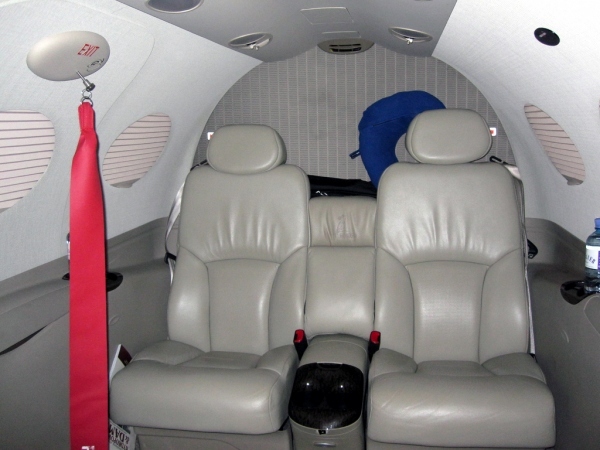 The Cessna Citation Mustang interior represents the middle of the range in the very light jet class. The cabin size of the Cessna Citation Mustang interior lies in between the Eclipse 500 and Embraer Phenom 100 very light jets. Inside the Citation Mustang Interior are 4 seats with 2 bucket style seats located toward the front and 2 bucket style seats with a center console located in the back. Interior coloring/styling is available in three categories: Bronze, Sterling and Platinum. The Cessna Citation Mustang High Sierra Edition interior has three different options for interior styling, Smoky Quartz, Black Pearl and Silhouette. Located on both sides of the aircraft are two stow-away tables for passengers. Also located on the sides are 2 cup holders per seat in the Cessna Citation Mustang Interior. Two extra cup holders are also located in the rear center console, giving the Cessna Citation Mustang interior 10 total cup holders for passengers. Seat belts are styled like ones found in automotive applications. At the entrance into the Cessna Mustang interior is the lavatory/toilet and storage space. A total of six windows are apart of the Citation Mustang interior giving good lighting in the cabin and good views outside. Lastly, the Cessna Citation Mustang interior has options for other items, including satellite phone service. A keyed cabin door is located on the forward left-hand side of the fuselage to allow entry into the Citation Mustang's interior . The Citation Mustang cabin door has eight locking pins with four on each side, a passive blade type pressure seal and is hinged forward with a folding two-step entry stair mounted inside the jet's entrance. The Cessna Citation Mustang door is monitored to ensure it is latched and locked. Located in the passenger cabin is a plug-type emergency exit located on the right-hand side of the cabin in-between the front and back seats. Information from the Cessna Aircraft Company. Above Cessna Citation Mustang Interior Cabin Photo by flightlog on Flickr. Photo (only) released under a Creative Commons License. For Reference: Cessna Citation Mustang Interior is also known as Citation Mustang Interior, Cessna Mustang Interior, C510 Interior, Cessna 510 Interior, CE-510 Interior, Citation Mustang Very Light Jet Interior, Cessna Citation Mustang Aircraft Interior, Cessna Citation Mustang Jet Interior and the Cessna Citation Mustang VLJ Interior. Also the Cessna Citation Mustang Interior is also known as Citation Mustang Cabin, Cessna Mustang Cabin, C510 Cabin, Cessna 510 Cabin, CE-510 Cabin, Citation Mustang Very Light Jet Cabin, Cessna Citation Mustang Aircraft Cabin, Cessna Citation Mustang Jet Cabin and the Cessna Citation Mustang VLJ Cabin.